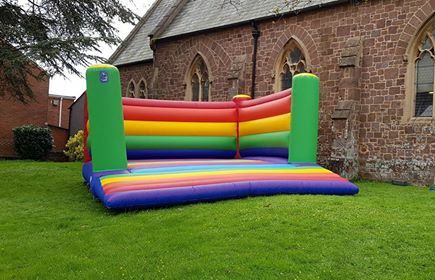 ADULT 20 ft X 18 ft ULTIMATE RAINBOW CASTLE. This beautiful bright ULTIMATE RAINBOW ADULT/CHILDREN'S CASTLE is the WOW of all WOWS. One of our biggest castles and suitable for children and adults. Perfect for weddings, events and big celebrations. Suitable for children right up to BIG children. Make your celebration the best in town with this beautiful big bright castle.